Capricorne des Maisons (Hylotrupes bajulus) and Grand Capricorne (Cerambyx cerdo). The word Capricorne crops up all the time in France, unfortunately it is misunderstood or misused by most native French people and as a consequence this leads to endless confusion for foreigners. 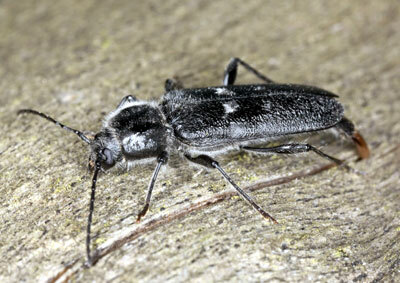 To clarify: Cerambycidae have a common name in English that is Longhorn beetles. In French the common names are Capricorne or Longicorne. Therefore what we have is not a single insect species but a group of insects belonging to the same family which in turn belong to the order of beetles. Longhorn beetles or Capricorne of many different colours, sizes and markings can be found in France but the two that are of apparent concern but perhaps not real concern to most householders are Capricorne des Maisons (Hylotrupes bajulus) and Grand Capricorne (Cerambyx cerdo). Both have a Complete Metamorphosis which has four stages: egg, larva, pupa and adult. 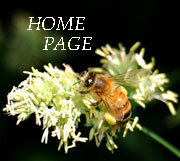 Insects such as beetles, flies, ants, wasps, bees and butterflies all go through complete metamorphosis. The Capricorne des maisons or House Longhorn male is variable in size from 8 to 15 mm; the female is larger at 10 to 25 mm. The body is flattish, generally dark; the wings which are also usually dark brown have two whitish or pale latitudinal bands. Antennae are never longer than half the body length for males and shorter for females. Flight period is usually June until August although individual beetles only live for 2 to 3 weeks and don’t eat; it is the larvae that do the eating. The eggs, up to 50, are laid in small fissures in the surface of wood, the important thing is that they only use softwoods, probably 95% or more is in types of pine and only occasionally in poplar. They will not use hardwoods, oak, chestnut etc. The larvae, which are a slightly creamy white, grow to between 15 and 30mm and take anything from 3 to 10 years to develop inside the timber depending on the quality of the wood as a food source and the average temperatures, 25 to 30°C seem to produce the fastest development. The exit holes from the wood are oval, 6 to 12 mm and at a tangent to the surface, galleries in the timber are extensive and can cause serious damage and weakening which can be a serious problem if softwood chevrons are affected in roofs. The excrement from the larvae is small cylinders of compressed sawdust around 1 mm long. The Grand Capricorne or Grand capricorne du chêne is one of the largest Longhorn beetles in France and can attain 6cm in length not including the antennae. The antennae of the males far exceed the length of the body whereas those of the female only reach the tips of the hard wing cases. Legs and body are black except for the tips of the wing cases which are red or reddish-brown. The flight period is from June until August and the adult beetles only take excretions from trees and blackberries. The eggs, between 100 and 400 are laid in deep fissures in the tree bark or in wounds primarily in oak trees, Quercus robur, Q. petraea, Q. pubescens, Q. ilex et Q. suber. They take about 10 days to hatch, they then burrow into the tree a little but remain near the surface for the first year. In the third year they return to being nearer the surface and at the end of summer or the beginning of autumn they create a cavity in which to pupate. Pupation lasts about 5 to 7 weeks; the emergent adult then stays in the tree until the following year. The larvae, which are white, can grow to 9cm. The thorax is large with the abdomen tapering away towards the rear. Their activity can cause serious damage, often creating “dead wood” areas, but it’s important to note that they only live and develop in living trees. 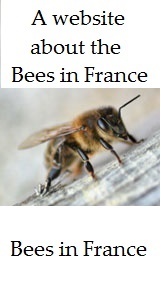 They are a species that benefits from total protection in France (arrêté du 22-VII-1993) and are mentioned in annexe II Berne convention and annexe IV of the Habitats directive, flora and fauna. As a species it is extremely menaced in the north of Europe and relatively common in the southern half of France. Useful links for this species.